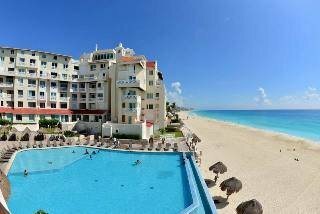 Cancun is synonym of fantastic beaches and pleasant weather; it’s the most popular destination in Mexico. Even though, it is a real paradise for students at festive events, Cancun offers great holiday solution even for families and those seeking solitude. This magical place in Yucatan is also famous for the ruines of Tulum and Chichen Itza. LocationThis hotel is located in Playa del Carmen; just minutes from the beach and the Cancun-Chetumal 307 highway. It is located in the heart of the city on the famous 5th Avenue; between Calle 8 and 10 within Playa del Carmen's main resort. There are.. This Cancun hotel is conveniently set by the ocean, right on a private white sand beach and within easy reach of area attractions such as El Rey Ruins, Playa Delfines, and Aquaworld. Local attractions also include Wet n Wild and Playa Ballenas. The area..
A very good property, good service and suitable for any kind of client. (12/08 MQ ) ## Location The hotel is located in the city center of Cancun ## Distance 26 kms to the nearest airport (cancún international airport) 5 minute walk to the nearest metro..
Isla Mujeres, the Island of Women, is a small tropical island rich in Mayan history and surrounded by powdery white sand and crystal-clear turquoise waters, about 13 km off the coast from Cancún. This charming, delightful hotel is situated in the north..
2 swimming pools, Gardens, volleyball court.Internet service at Front Desk, Free Parking, Safe deposit boxes free of charge at Front Desk. Good property Location the Hotel is located in the heart of the Hotel zone. at 5 minutes from Downtown 10 minutes..
Calypso Hotel is filled with warm design that goes hand-in-hand with traditional Mexican hospitality throughout your stay. Forget the stress of everyday life and be swept away by a beautiful atmosphere during an unforgettable and relaxing vacation experience.. This hotel is located in the leisure district of Cancún just 20 minutes walk from the town centre, where guests will discover many shopping and entertainment venues as well as bars and restaurants. Links to the public transport network lie in front of.. The Cancun Bay Resort is located centrally in Cancun in Cancun¿s hotel zone and offers breath taking views of Mujeres Bay and is within walking distance of several restaurants, shops and entertainment venues. Also just a short distance from the hotel.. This hotel is located on the outskirts of the district, directly beside the beaches and a few paces from the landing stage of the excursion boats. A diverse selection of shops, restaurants and bars as well as links to the transport network can be found..